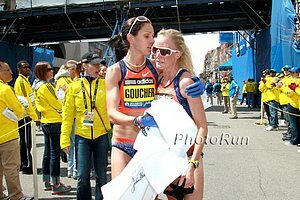 "When I went into the 2012 Boston Marathon I didn’t know what the future held and I was putting everything into that race. I actually had a job interview about the same time. 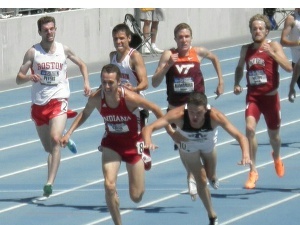 I pursued that race with no regrets. At the starting line I knew that many runners would be taken out of their games because of the high heat. I thought that whatever happened was going to happen but that I wasn’t going to quit. A lot of people quit that day who had the potential to beat me if they stayed in the race, but I kept plugging away and plugging away and told myself I was doing well, to relax and that I’d be okay." "This year I pursued it the same way in that there is no tomorrow for me. I figured that if this race was going to define my career that I wasn’t going to beat myself. There were times this year when my foot was hurting badly, but I told myself to relax and that I was all right. I talk to myself and am a coach to myself during the races. As I plug away and other runners are coming back to me I get more confidence. All of the fans are going crazy and I keep telling myself, ‘You can do it! 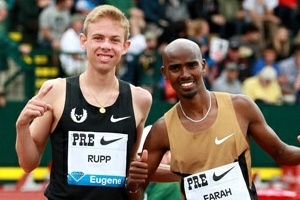 You can do it!’ That has been beneficial to my success in both races." - Jason Hartman, talking about his thoughts during the 2012 and 2013 Boston Marathons where both times he finished 4th as the top American. Jenny Simpson, Eric Jenkins, Diego Estrada, Mac Fleet, Chris Solinsky, The PSU Men And Villanova Women Impress, The Mystery That Is German Fernandez This week, we heap praise on Diego Estrada, Eric Jenkins, Mac Fleet, Chris Solinsky and the PSU men, but give the most to the Villanova women. Along the way, we slam the Arkansas men, talk about Jordan Hasay and the mystery that is German Fernandez and announce Lawrence Okoye, a future NFL star for the San Francisco 49ers. Plus a 17-year-old runs 10.01 – and he’s from Japan. Good Gary Cohen Interview With Jason Hartman Who Talks About The 2012 & 2013 Boston Marathons As Well As His Full Pro, College And HS Career Good news is he isn't done as he talks about breaking his 2:11:06 PR and maybe running NYC. Down The Back Stretch Interview With Jamie Cheever After Her Huge Steeple PR At Payton Jordan "This race has changed my goals. Before the race, making a World Team was a goal for another year, but I now think I should be focusing on getting to Moscow." Olympic And world TJ Champ Christian Taylor Says He's Stronger For Having Made The Move To The UK To Continue To Be Coached By Rana Reider He says that he thinks he's capable of breaking Johnathan Edward's almost 18-year-old WR. Queen Harrison Named USATF Athlete Of The Week For Her Win Over All 3 US Olympians In Drake 100 Hurdles She won in a World leading 12.71. Japanese Teen Yoshihide Kiryu Who Ran 10.01 To Tie The World Junior Record Will Try And Go Sub-10 At Sunday's Seiko Golden Grand Prix He's already talking about going up against Bolt saying, "I want to run alongside Bolt (at the worlds) and see how he is different from me." 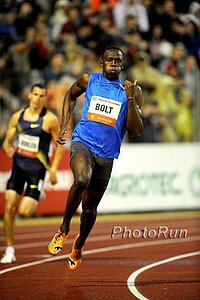 Well Yoshihide, for starters Bolt is taller, not Asian and almost half a second faster over 100m. 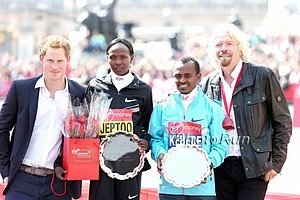 May 19th Gifu Seiryu Half Marathon: WR Holder Zersenay Tadese Vs 2007 World 10k Bronze Medalist Martin Mathathi As Well As Ryan Vail And Yuki Kawauchi The women's race is led by 2012 Amsterdam Marathon runner-up Eunice Kirwa Jepkirui, 2008 World XC silver medalist Mestawet Tufa, and two-time Olympic marathon silver medalist Catherine Ndereba. Dartmouth Alum Matt Miner Is The "Ivy League's Latest Gift" To The University Of Oregon The UO grad student was the only one to dip under 4 minutes (3:59.9) on Oregon's winning 4xMile team at Penn Relays. Hakone Ekiden University Select Team Made Up Of Top Individual Runners From Schools That Fail To Qualify As A Team May Be Cut To Once In Five Years Yuki Kawauchi (who benefit from the select team) has spoken out against this. Results From Drake Relays Road Races: Deep Prize Money Generated Some Competitive Fields Emmanuel Bett won the 10k in 28:23 over Kenneth Kipkemoi (28:29). Mark Kiptoo won the half-marathon in 1:02:27 as the top 5 were all within 8 seconds of each other.